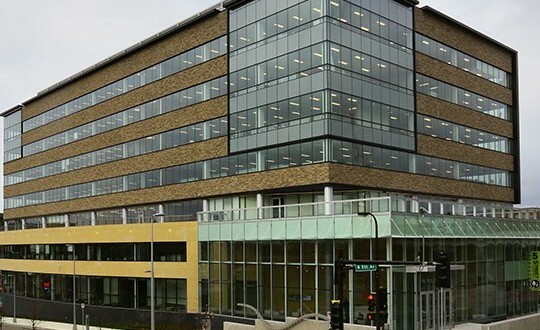 7-story office building for the Be the Match Foundation headquarters, a non-profit company sponsored by the National Marrow Donation Program. The building represents the largest and most diverse bone marrow registry in the world. Bon Appetit cafe occupies the first floor, complete with a full kitchen a featuring specialty exhaust system ducted to the roof. Construction took place in the up and coming North Loop area, downtown Minneapolis. 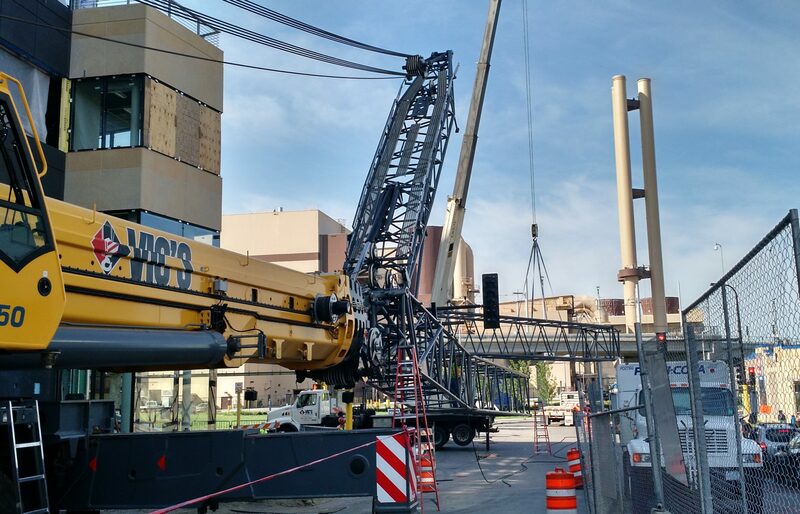 The building is served by four custom-designed Seasons 4 rooftop units, all set by the massive crane pictured below. This project used massive ductwork to distribute air throughout the space. Allan Mechanical chose to install Kingspan Kool Duct, an innovative technology using phenolic insulation material coated with silver aluminum instead of galvanized sheet metal. The result saved installation time, decreased air leakage, eliminated heavy sheet metal, and ensured the safety of employees. A photo of one of our employees with one of the massive duct mains can be seen below.